How many paper aeroplanes can you make on the spot? Do you just build the same boring design as well, which to top it all doesn’t even fly very well? Its hard to remember the instructions for the more complicated planes but the ones which are easy to make don’t fly very well. With this app we’ll guide you through building a range of different designs. You’ll find in the main menu an overview of all the types of aeroplane and you can take a closer look at one of the 20 designs. Just click on the aeroplane which you want to build and you can have a look at it on a fantastic 360° picture. Ratings are also given for each plane’s characteristics – whether it’s just for show or if it can actually fly as well. 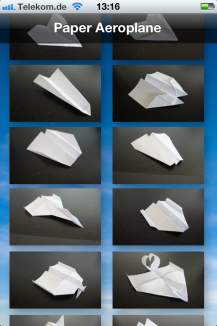 Once you’ve picked an aeroplane, you can make it by following the step by step picture instructions. Every step is clearly shown in a picture accompanied by an instruction. This turns the making process into child’s play and the results into real works of art. 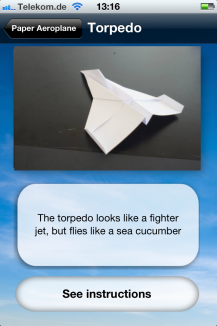 In this app we’ve taken the 20 most popular types of aeroplane for you to replicate. Some of them look fantastic, but don’t fly very well, whereas others don’t look much but fly like the wind. Others even combine the two. In the same way, the aeroplanes are divided into two types – those which are to be thrown and gliders. You’re probably asking yourself: what’s the difference? 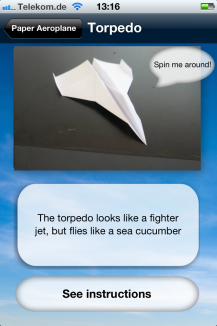 Do you know the problem that some types of paper aeroplane aren’t hard to throw but crash land soon after take-off, while others need a strong throw to start them off flying in the first place. Therein lies the difference: a glider is easy to throw and stays in the air for a long time but as a result doesn’t travel so far. An aeroplane for throwing however needs to be thrown hard, gets a faster speed but takes a nose-dive trajectory (hence why you tend to use these in a room rather than to throw out of the window from the top of a tower block. 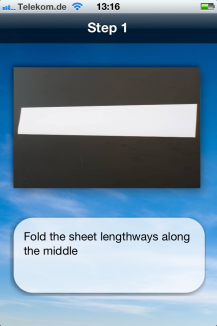 With the help of this app you’ll never have problems building a sturdy paper aeroplane again. 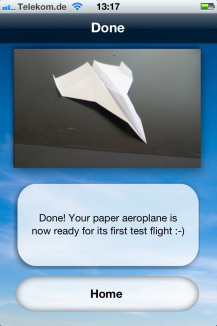 If you’re sitting around at work or in school and you’re bored – take out your phone and build yourself a paper aeroplane which will be the envy of all your work or schoolmates.